On Monday, I chatted with Sherri Smith about her new release FOLLOW ME DOWN which came out Tuesday, Learn about exciting release day parties when you have small children, Sherri's passion for vanities, her favorite HGTV shows and more. Hi, Sherri. Thank you for taking the time to answer a few questions. Please tell us a little bit about yourself. Hi! Well, I live in Winnipeg Manitoba with my family (and large extended family), where I question my sanity every winter. Moving never wins out, because I know where everything is, and not wanting to leave your house several months out of the year is a great way to keep you in your chair writing. 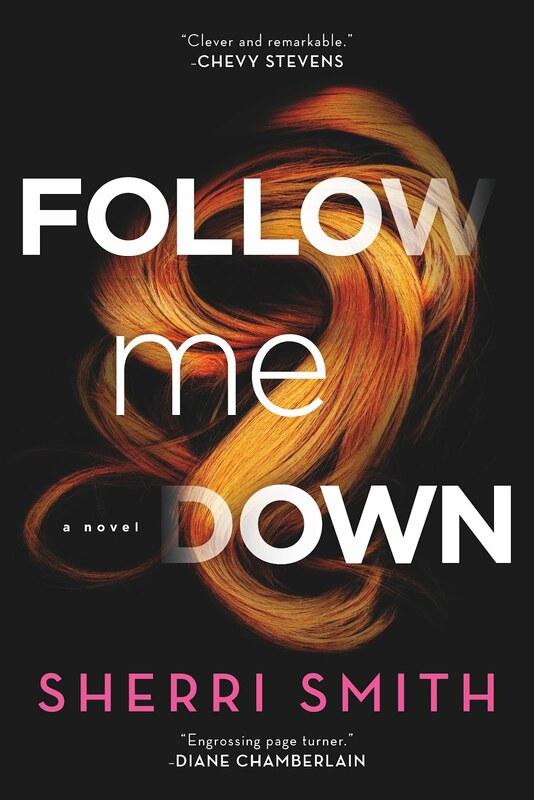 Tomorrow (Tuesday, March 21) is a big day for you as your new thriller FOLLOW ME DOWN comes out. Do you have any fun plans to mark the day? Well, that all depends if we’re able to get another babysitter since ours just canceled. If not, we’ll be heading out to a place where the tables are decked out with coloring mats, three primary color crayons and picking out a toy at the end from a germy treasure chest is the main event. I’m thinking Boston Pizza just before 5 pm? There better be a good drink special! That sounds like fun, but then again I spent my weekend with my parents at a charity thrift sale. So I'm all into spending time with family. I love stories with great characters. Who is your favorite character in FOLLOW ME DOWN? Why? Well, I’d have to say Mia of course. I love how flawed she is, how her gummy brain works, how she can twist things to suit whatever she’s chasing down. I admire her loyalty and how she keeps her snarky humor going because I think it’s true of how a lot of people cope with their dark childhoods. How did this story come about? What was your approach to writing FOLLOW ME DOWN? Do you have any writing rituals? Follow Me Down started with an image of a semi-rundown apartment block with a rusty looking pool in the back. There’s a teen girl in the pool, floating on an air mattress. She has that look girls this age can have, a kind of mournful sadness. I kept wondering, who is this girl? Why is she so sad? Who did she lose? Does she belong there or not? From there, a plot and characters eventually swirled together through sheer will. My writing approach is to write out a thousand worthless drafts until I get something I am happy with. So y’know ‘efficient,’ is NOT a nickname I go by. Basically, I wanted to write a book I’d want to read. That’s it. I've read that you enjoy restoring furniture. What is your favorite piece you've done or are you working on a piece now? Do you have a favorite DIY television show (I personally love Fixer Upper)? I mainly restore bedroom vanities. I love these old pieces, and I am always surprised that they ever fell out of popularity. You get to have all of your make-up in one spot, a stool and mirror so you can sit and gaze at yourself (hey, they’re called vanities for a reason,) there’s room to enjoy a glass of wine or two (so you think you look better than you do.) You get to feel connected to all the other women who sat there before you, probably worrying about the same things. I love them. They’re such romantic pieces. My favorite vanity that I worked on was this old ornate piece from the turn (of the last) century that once belonged to a professional clown. This red make-up just kept bleeding through the stain I was using. It was so creepy but it turned out beautifully. I can watch HGTV all day long. I love Property Brothers, House Hunters International (it makes me daydream,) Leave It to Bryan. I could go on! I'm so looking for a vanity for my bedroom. (I've wanted one since I watched Downton Abbey). 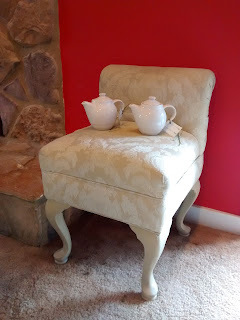 I found a lovely vanity stool at last year's thrift sale, but so far no dice on a vanity to go with it. Too bad you're in Canada otherwise you might have been able to hook me up. I could go one about furniture projects, but let's get back to your writing projects. Do you have any new writing projects in the works that you can share with us? Thank you for taking the time to chat with me today and good luck with the release of FOLLOW ME DOWN tomorrow. Thank you so much having me! 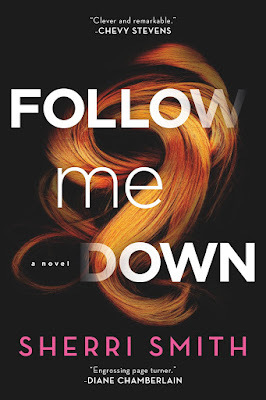 If haven't already, be sure to read MK French's review of FOLLOW ME DOWN. Buy your copy at Amazon or enter the giveaway below. When not writing SHERRI SMITH spends time with her family and two rescue dogs, and restores vintage furniture that would otherwise be destined for the dump. She lives in Winnipeg, Canada, where the long, cold winters nurture her dark side. 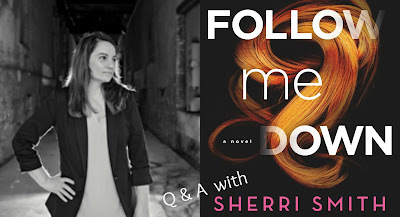 FOLLOW ME DOWN is her first thriller. Visit her online at http://www.sherri-smith.com/, and on Twitter, @SL_Smith_. I still love holding a physical book when I read. One good reminder is when my e-reader, that's not even a year old, is letting me know that it's running out of storage space. That's one thing about a hardcover, it never runs out of space. Looking forward to reading.